One early evening during a summer day in 2012, I had the opportunity to go to a restaurant that was hosting a wine and food pairing. Being perhaps one of the individuals, if not the only one, who was not a sommelier, I thought that the event would be a bit out of my league. And then the food came to the table. Yes, the wine was splendid. However, the food was a major highlight for me and one that stayed with me since that participation in the wine and food pairing. With work gobbling up a great deal of my time and then my high school sweetheart and me taking an extended vacation to Calgary, Montreal, and Lisbon, scheduling a return to the restaurant of my culinary dreams had faded. 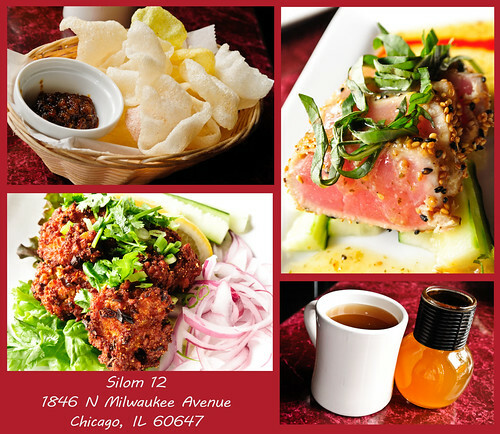 A new year began in 2013 and I had finally entered a note in my cell phone to make a reservation for a dinner at Basil Leaf Cafe at 2465 N. Clark Street. It would be my luck that the cell phone went to sleep permanently on me and January was speeding by fast. There was no way that I was going to find myself well into 2013 before actually returning to the restaurant. With the New Year I had decided that I would focus on degustations more during my dining excursions. 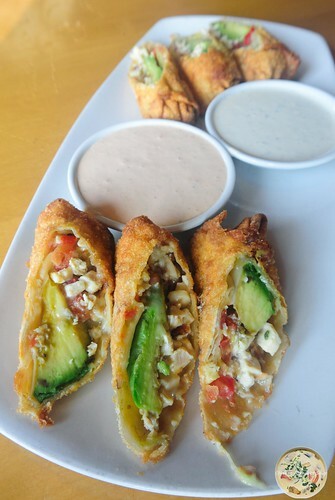 Too often I find myself scrambling to eat my appetizer and entrée before they are cold because at many restaurants both come to the table simultaneously. That is very much an epidemic at American style restaurants because there appears to be a need to rush patrons. Since Basil Leaf Cafe was the first restaurant that I was blogging for 2013, there was no better way to start my newfound appreciation of degustations than the present. A most inviting welcome on entry and my pick of seats because I had arrived before the dinner crowd, I handed the menu to my server, told her what I liked, and told her to surprise me. 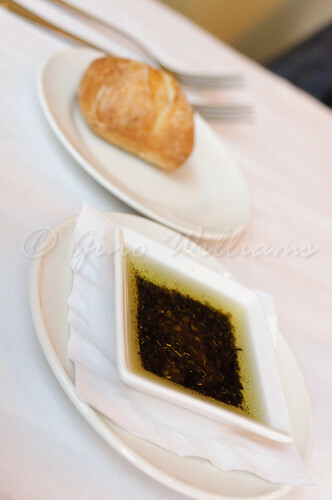 As a complimentary l’amuse, there was warm, homemade bread served with an olive oil that had various Italian herbs and spices in it. I would normally add Parmesan cheese and pepper, but that would have been a bit evil considering how flavourful the bread and olive oil were together. Oh, if I may add, bread is a source of weakness for me. I can’t deny it. I can’t refuse it. 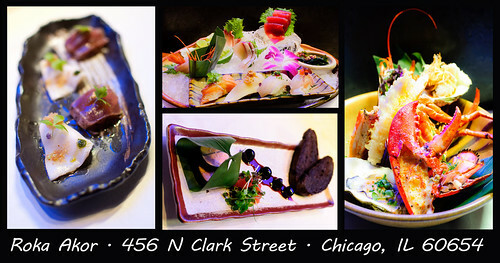 And if it is as good as what I had at Basil Leaf Cafe, then I tend to indulge to excess without any additional thought. And a note to myself is to find out the recipe for the olive oil so that I can try my hand at it at home. 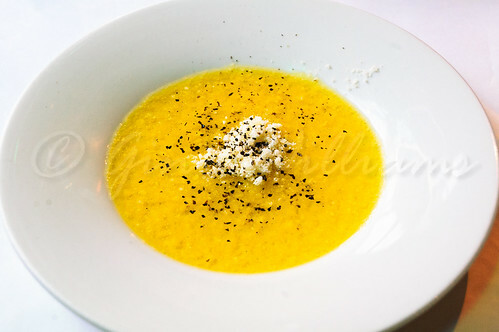 The first course to the table was a butternut squash soup. 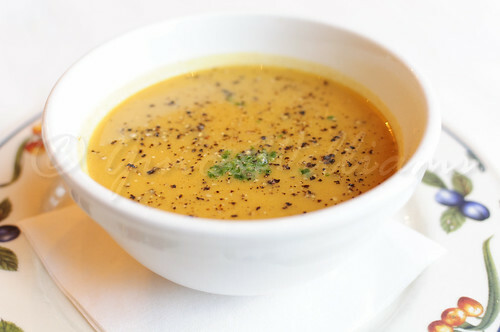 Let me start by saying that I have had my share of butternut squash soup and have loved it. This was the first time I had the soup and the first sip gave me pause. It was absolute heaven. I had a few more sips and then declared with certainty that I had just tasted the best butternut squash soup ever. There was no aftertaste. And the hint of cinnamon, allspice, nutmeg or whatever spice was added left me with a rather wide smile. I guess my server thought that I was making up a story when I said that it was the best butternut squash soup that I had ever eaten. There was no lie and because I had to maintain decorum, I did not take any of the homemade bread and go around the edges and bottom of the bowl. Only the first course and it was evident that the rest of the meal was going to be progressively better. And then there was a mixed berry salad that came to the table for the second course. I had told the server that I was not a fan of nuts and not because of any allergies. The texture and taste do nothing to assist my appetite. The salad was one that usually comes with walnuts. However, they were omitted. Having been to restaurants where my mentioning of not liking nuts was treated as an omission and I had to pick around the nuts to keep from making my whole dining experience unsavoury, the fact that my server had explained that walnuts are usually an ingredient in the salad and they were left out at my request, that made each bite all the more worthy. The mark of an outstanding wait staff is when they listen to the customers. 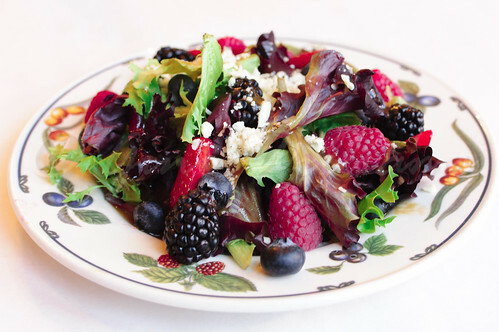 Raspberries, strawberries, blackberries, and blueberries sat atop lettuce, drizzled with a balsamic vinaigrette, and topped with crumbled gorgonzola cheese. The only other times I have had any kind of fruit in my salad were when I had apricot salads at one of my favourite Algerian restaurants. Berries on salad always looked a bit much, albeit quite appetizing. However, having the mixed berry salad and seeing that I had left only a smear of the vinaigrette afterwards was proof that it was not only visually stunning but it was incredible to the palate. I was going to be daring initially and try two entrées — a vegetarian dish and a seafood dish. After being warned that the portions were large, I opted instead for the seafood platter. The third course was a seafood linguine. 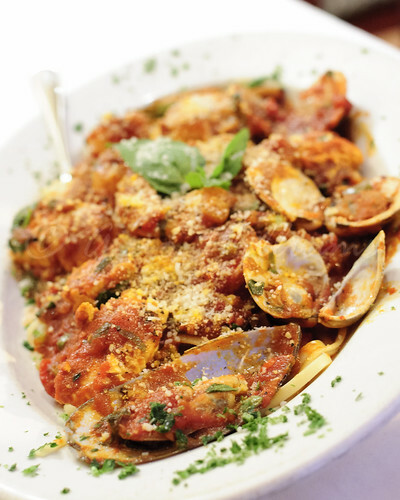 Plump shrimp, fresh salmon, well-seasoned mussels, tender scallops, and delectable clams rested on a bed of linguine and topped with a red sauce before I began working on the entrée. The pescatarian in me yelled, “Bravo!” and enjoyed the whole dish leisurely without a care in the world. Perhaps if I had a glass of wine to go with it, say a Merlot or a Malbec, I would have had a Food Network composition. But the dish was perfect with the glass of orange juice. One thing that I really liked most about the seafood linguine was that it had a spicy kick to it without me requiring glasses of water. And the seafood was nothing akin to the nibble size morsels that you find in most Italian seafood dishes. Not only was the portion of the entrée large but the seafood was not lacking in quantity and quality of freshness. I kept screaming, “Bravo.” Of course, it was to myself, though. After the bread and olive oil, soup, salad, and seafood linguine, I required a bit of rest before entertaining a coffee and dolce. In keeping with letting everything be a surprise, I deferred to my server for the sweet. 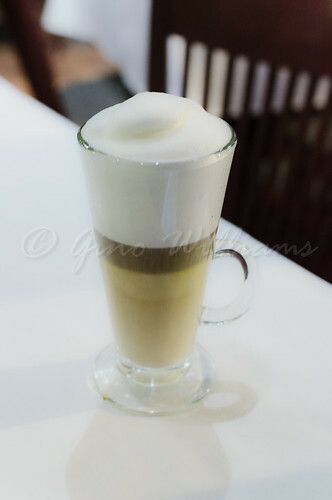 Whenever I go to an Italian restaurant, I always choose espresso or cappuccino. It probably would have been wiser for me to have ordered an espresso so that I could have avoided fighting sleep after such a wonderful meal. Instead, I had a cappuccino and my server brought an apple tartlet with a dollop of vanilla ice cream to the table. One bite and I could have hit a tenor aria to have brought the restaurant to its feet for a standing ovation. It was clear that the dessert was not something you find in the frozen section at the local market. No, there was no syrupy compost drowning chunks of overcooked apples. 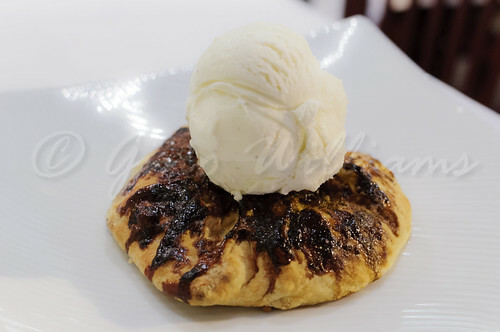 There was flaky crust enveloping thin, tart apples that had been cooked in their own juices. If it were not for the ice cream accompanying the apple tart, I would have dragged my dessert feast for a full hour. Being cognizant of the ice cream melting, I savoured the dessert and the cappuccino slowly and to completion. And let me just say that I did not need to add any sweetener to the cappuccino. The mark of a splendid cup of coffee is not having to add extra sweeteners to it to make it palatable. When you can enjoy your coffee the way I enjoyed the cappuccino at Basil Leaf Cafe, then you have had your coffee proper. 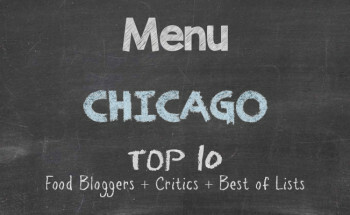 One thing I have not considered was coming up with a Top 10 list of restaurants in Chicago. 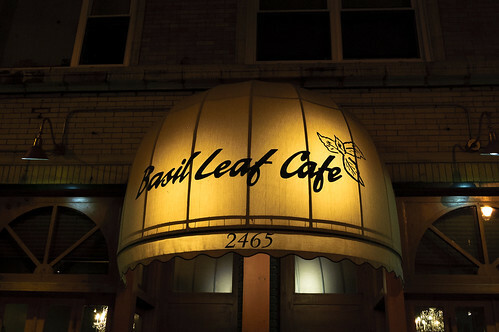 What I can say with certainty is that as of me penning this blog entry, Basil Leaf Cafe holds the number 1 spot. That is a bold statement. Yes, others may scream that I am being unfair and that I need to come to their restaurants. 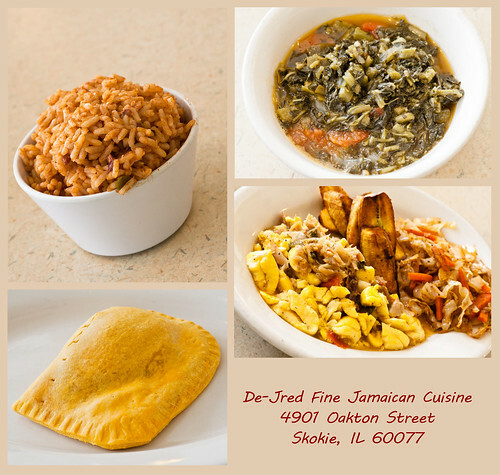 Believe me when I say that as long as I am in Chicago, I will find my way to your dining haven. One thing to note is that when service, high quality of cuisine, and price come together to form an inviting request for a return, how can you possibly deny a bravo and an encore? You simply can’t. Only on a few occasions have I chosen to let my server make my dinner choices for me based on my likes and dislikes. 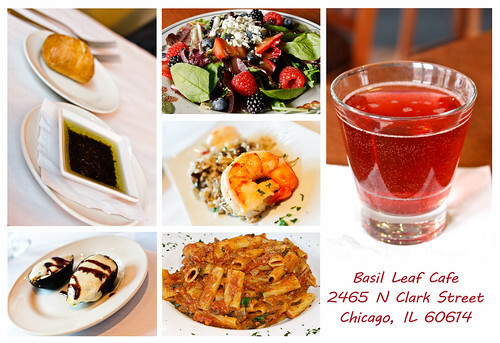 What I experienced at Basil Leaf Cafe was a winning game of cuisine roulette. I was impressed thoroughly during the wine and food pairing at the restaurant that one summer evening in 2012. I was even more impressed during my second visit. I shall indeed return for an encore. 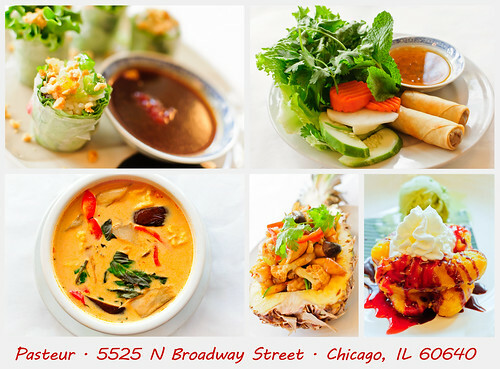 I highly recommend that you visit Basil Leaf Cafe and see for yourself. As a food enthusiast, I often find myself retracing my visits to certain restaurants. There is always something during that initial visit that becomes a draw to pull me back. The food was outstanding. The service was top. The price was reasonable. Any one of the three may have applied, but when you get an authentic invitation to return, that somehow trumps it all. When a great friend and I had gone to Trattoria 225 in February, not only did I find every aspect of the visit worthy, but the comfort the staff had engaging us in conversation spoke volumes. 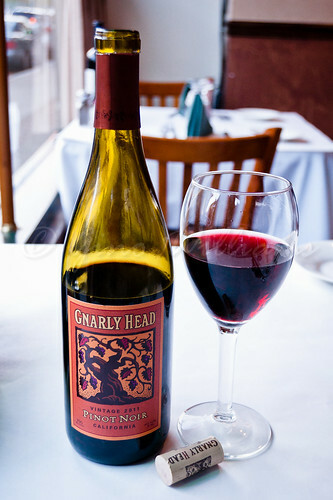 At many restaurants, taking customers to their seats, getting their orders, bringing their food and beverage to their tables, an occasional “Is everything all right?” and a plastic smile is “doing the job.” At Trattoria 225, making you feel that you have gone to a short stay with family is their job. 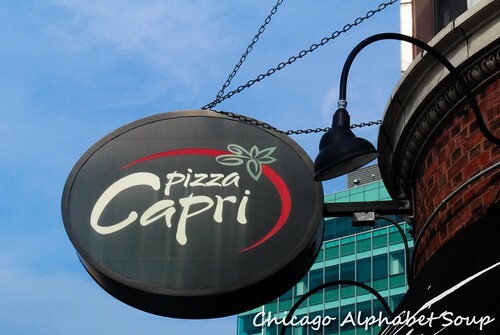 Located at 225 Harrison Street in the Arts District of Oak Park, Illinois, Trattoria 225 is one of my favourite Italian restaurants in the metropolitan Chicago area. When my friend and I had gone earlier in the year, I had a chance to talk to the manager about photographing the food — my food — and when a good time would be to come in for my own personal assignment. 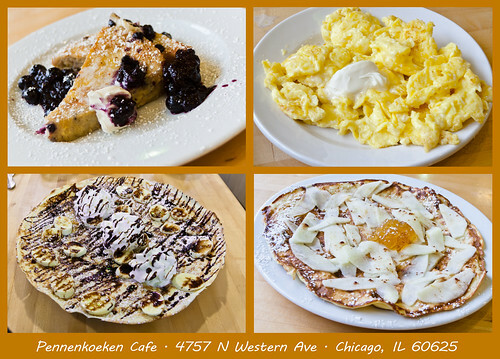 At that time, I did not have my camera, which was just wrong per the Foodie Mantra. As we sat at the table and worked our knives, forks, and spoons, on some of the most appetizing Italian dining this side of the Atlantic Ocean, I knew I had to return with my camera to capture the impressions that made us smile. But at age 44, time has a way of flying by, as if whole days or weeks are being devoured by a time monster. Fast forward to August and I finally return and upon being greeted, I knew that I would be quite thankful for what I was going to receive in terms of service and quality of taste. I started with a peach bellini. 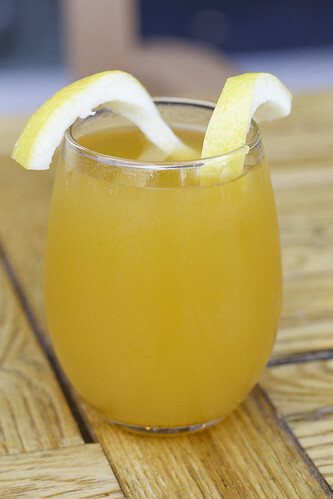 Now, I usually view peach bellinis as brunch drinks — ala cosmopolitan, mimosa, and the like. 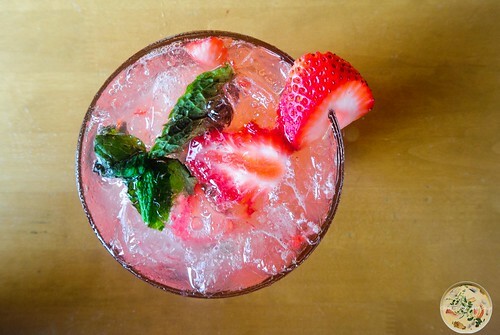 Yet again, it seems that bartenders at Italian restaurants have a mantra of showcasing their best talents only. 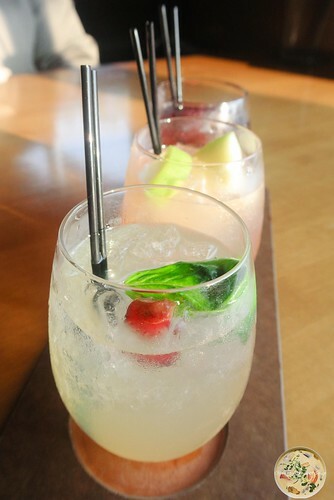 The peach bellini was fruity and spiked nicely, but not to the point where I was hovering above the tree tops. The peach flavouring tasted more like a liqueur on the palate as opposed to a nectar. That was not bad at all. 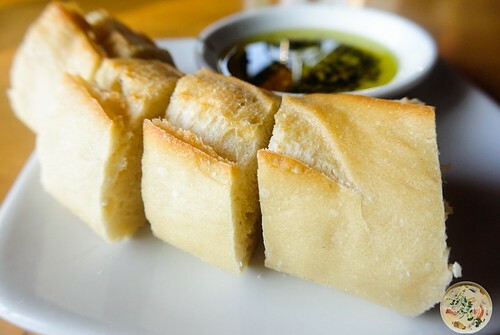 Not to quench my thirst too quickly, I indulged some warm Italian bread and olive oil with Parmesan cheese. Wow! I have had Italian bread that I had to struggle with in terms of tearing or cutting. Even then, I had to gnash at it — thankful that I still have my own teeth, not dentures. The bread at Trattoria 225 was nothing like that. Warm, crusty on the outside, and fresh on the inside, I had all of it with olive oil that did not taste like it had been purchased from a chain grocer. There is something to be said about olive oil that has flavour, not just oil in a bottle with a label saying that it is olive oil. As the wind blew about and I watched the sun set, I wondered what I would have to leave me with my saying: Who says that the first time sets the standard for how good “it” is? For an appetizer, I ordered butternut squash ravioli. 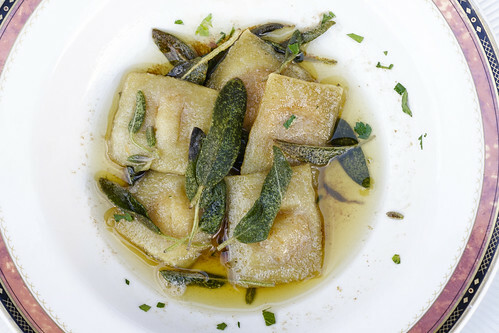 The combination of brown butter, roasted walnuts, and fresh sage over the ravioli made for a wise decision for an appetizer. Neither heavy-handed nor laissez faire with the spices, I enjoyed each of the mini ravioli without complaint. Butternut squash soup is nothing new to me, but adding it to ravioli that had been baked to a moderate crisp had left me pondering a future menu of homemade butternut squash ravioli and butternut soup served with some meaty fish — tilapia, red fish, or trout. It may have been that the ravioli prepared in a fashion other than stuffed with meat, cheese, or spinach, that the plate was such a highlight. In true Oak Park fashion, a couple sitting at the table next to me engaged me in conversation about restaurants in the Chicago and surrounding areas. To quote the wife, it felt like we were abroad, because people usually if not ever strike up conversation with random strangers. Oh what niceties there are to learn from others. 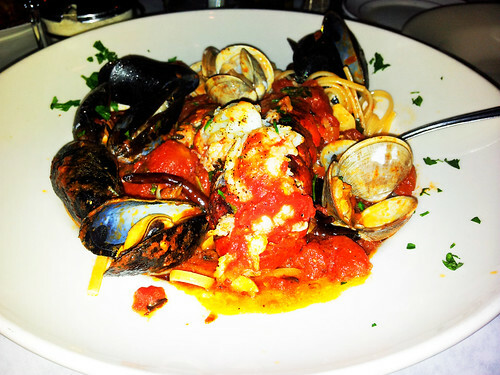 For example — recommended pasta dishes like linguine ai frutti di mare. It has been over a decade since I have partaken of spaghetti and meatballs. 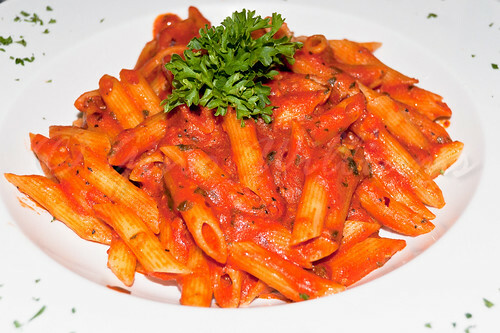 I love Italian dishes that have a tomato sauce base. 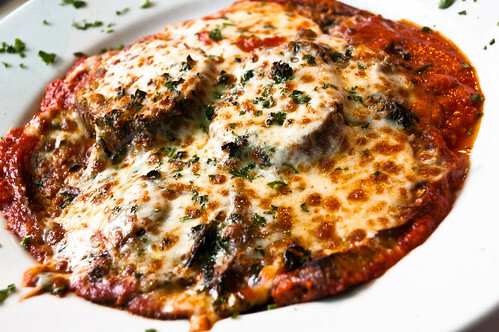 But having been exposed to more rustic Italian dining, red sauces had seemingly disappeared from my radar — with the exception of eggplant Parmesan and an occasional dish of rigatoni. So when the couple had recommended the linguine ai frutti di mare, I was ridiculously appreciative when the waiter brought a colossal plate of the entrée to the table. Linguine, mussels, shrimp, and calamari in a slightly spicy tomato sauce had left me in a twilight daze before I was three-fourths of the way done. Italian dishes with a tomato base tend to be heavier, but the portions of the linguine ai frutti di mare were rather substantial. As much as I wanted to eat all of it, I also wanted to leave a little for lunch the following day. So I behaved. 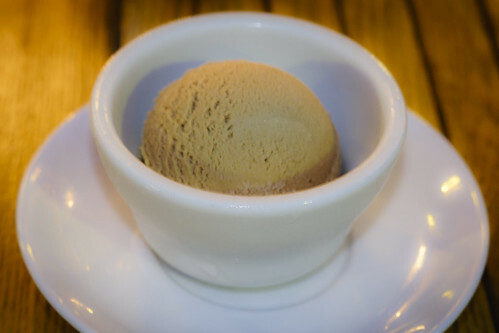 For dessert, I settled for something light — coffee hazelnut gelato. Only the size of a dollop, it still was satisfying. Rich and creamy, I would find it hard to believe someone if they had said that it came from the ice cream section at the local market. It was definitely good gelato, not ice cream. As for the coffee, I had spoken too fast and said that I wanted regular coffee. 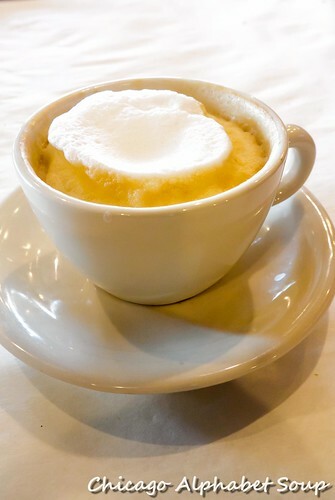 Cappuccino is usually my drink of choice after fine Italian dining. 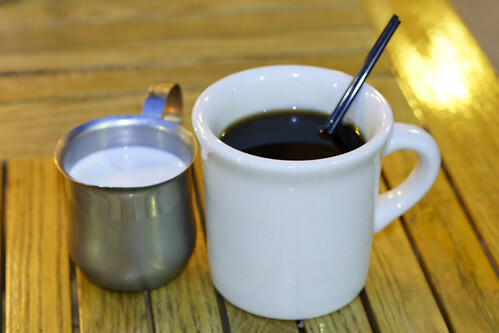 Honestly, I was rather glad that I had ordered the regular coffee along with cream. The mark of good coffee may be noted by one of two possibilities: the coffee machine is in top working order or the brand of coffee is of Top 5 quality. I drank the coffee sans sugar and that was truly an indication that I was not imbibing Folger’s or Maxwell House. Once again, I got a chance to talk to the manager when he had stepped outside to welcome the customers who had opted to have their meals outside. 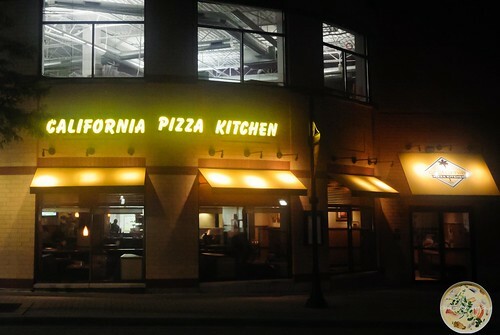 Although the byline on the restaurant’s awning says “rustic Italian dining,” he explained that the restaurant is more of a community eatery that serves Italian cuisine. If I have not learned anything about Oak Park, one thing I will say that I have latched on to is the notion that community is a major factor in the Oak Park meme. Any time I have gone to a cafe, restaurant, diner, or any establishment in Oak Park, there is a very strong sentiment of family and neighbours. You will always see families communing together. The same applies to neighbours who apparently gather for fellowship. 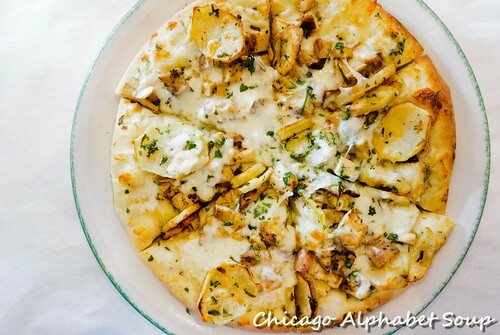 Clearly, Trattoria 225 is one of the community hubs in the southern end of Oak Park. Then again, when you have an establishment with a manager who takes the time to talk to the patrons rather than observing business from a distance, you understand the allure. 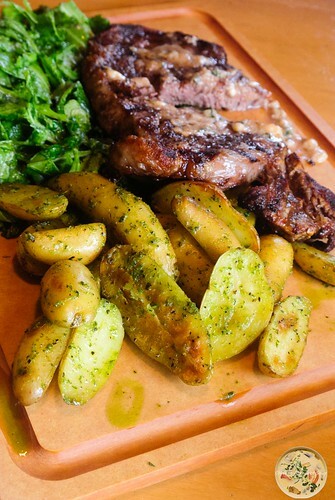 It was winter when I went to Trattoria 225 the first time. Although I missed spring and finally got to place my feet under a table during summer, I can say with certainty that it has indeed become one of my top eateries for all seasons. A few nights ago I met a great friend for dinner in Wheaton, Illinois. 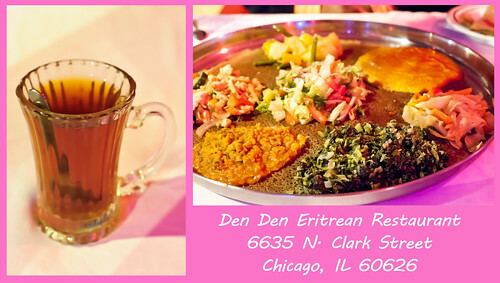 With me working in the West Suburbs of Chicago and he living even farther off the map, we decided that we would meet in a central spot and decide where we would work our teeth on something worthy. Before I left work, it had dawned on me that I had left home earlier without any one of my high-end cameras. Not that I had to have one of my Canons or one of my Nikons, but not having a camera is a cardinal no-no in the foodie mantra. See excerpt from Section 5.2 in the Foodie Bylaws. All foodies must have in their possession a camera that they shall use to capture the impressions of food and beverage. The cameras are not limited to professional cameras, prosumer cameras, point-and-click, and cameras on cell phones. Acknowledgement as a foodie shall be revoked if a foodie does not have proper equipment for photographing food or beverage. When I finally realized that all I had with me was my cell phone, I cursed under my breath just before I sent a text message to my friend to tell him to bring his Canon. As a photographer, cell phone cameras are wicked devices that are better used for texting, setting calendar events, sending email on-demand, and posting ad hoc posts on Facebook. Needless to say, my friend had left home well in advance of my text message. More cursing and then me dropping my purist photography air and settling on using the camera on my cell phone. It takes great photos anyway. 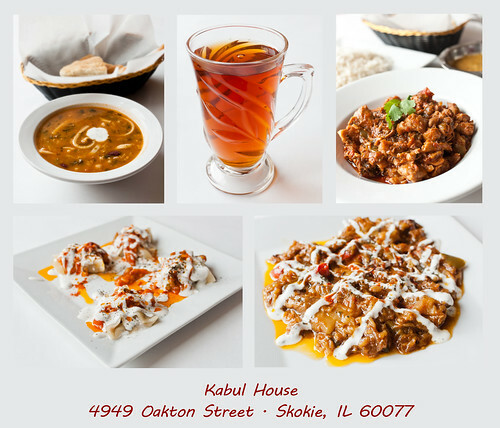 Once in the quaint downtown of Wheaton, my friend and I looked at the menu at the restaurant we initially said we would try. Then we opted to review the menu at another Italian restaurant he had said received great reviews. 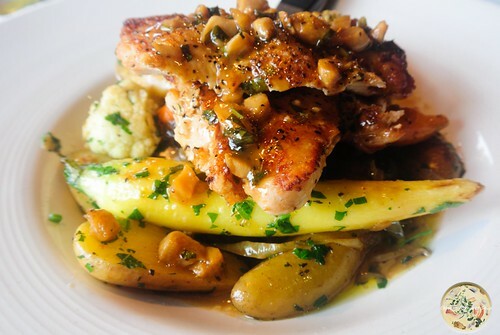 At first glance, we settled on the second restaurant, Il Sogno, at 100 N. Hale Street. Up the stairs we went where we entered a dimly lit room with aromas all in the air. We knew that we had made the right choice. With a server who was very much knowledgeable of the menu without having to refer to it when we asked for recommendations and very much in tune with the specials for the evening, my friend settled on chicken parmesan and I ordered lobster da fravolo. 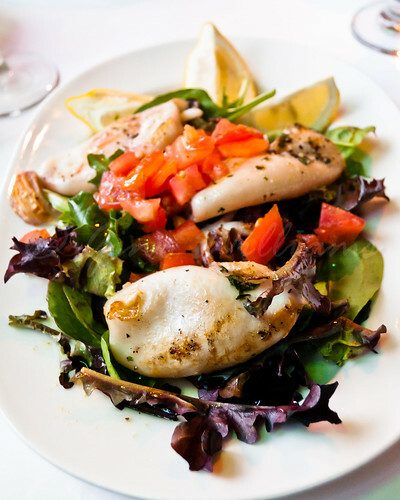 But before the entrées, we accepted the suggestion from the server for stuffed calamari. Let me just say that instead of getting a plate of well-seasoned rings of calamari, we got whole calamari stuffed with a cream sauce that deserves an encore. This appetizer was so delectable that if I get any more fried or plain calamari rings in the future, I may toss the plate on the floor and bark an obscenity in Italian. If you think that my description of the stuffed calamari was a highlight, that was nothing compared to the entrées. The chicken parmesan that my friend ordered had come with a tomato sauce that was lightly spicy and with a hint of ginger. Hello! I have had a tomato sauce flavoured with ginger to the point where it was pungent. The faint taste of it at Il Sogno added an accent to the dish that made every bite a gala. As to the lobster da fravolo, there is a certain Italian restaurant in Chicago proper where I have been — that will remain nameless — that could take notes. 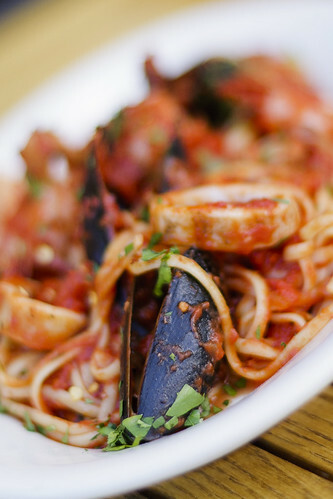 Spicy like an arrabbiata, the well-seasoned lobster, mussels, and clams sat atop a bed of linguine under a lip-smacking tomato sauce. I drooled. My eyes went to slits from food comatose. I smacked the table. I hummed. My friend and I indulged ourselves to the point where we completed our entrées and had no room for any desserts. The only thing that we could muster was cappuccino and that was absolute top. Because I could not get the thought of Il Sogno out of my mind or the wonderful taste of the calamari and lobster da fravolo out of my mouth — okay, an exaggeration — I was in Italian mode for much the remaining week. Having gone to Korean barbecue with another friend earlier in the week and then to Il Sogno the next evening, I decided that I would complete the weekend in my kitchen rather than dining out again. How about that? There has to be a special section in the Foodie Bylaws for indulging yourself in your own kitchen, as long as you abide by Section 5.2. Well, that was no problem. Being a lover of bread, I baked a loaf of Italian bread. 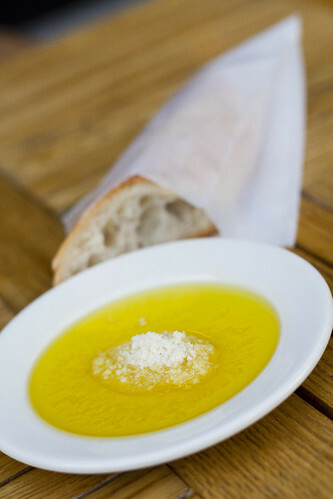 And no loaf of Italian bread is complete without some fresh parmesan cheese, olive oil, and black pepper. 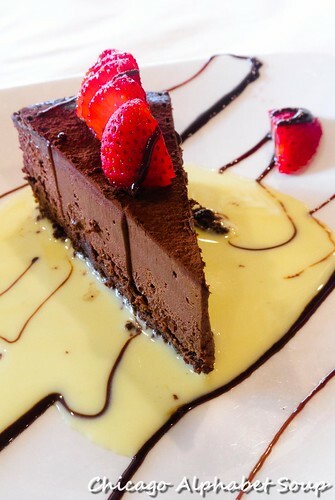 How do you say, Yummy, in Italian? Warm from the oven and me sopping the olive oil, parmesan cheese, and black pepper while drinking pineapple juice from a mason jar, this complement was ideal with the butternut squash risotto that I prepared. Not to toot my horn, but when your neighbours knock on your door inquiring about whether they can borrow some ingredient only to sit at your counter, you are doing something correct. 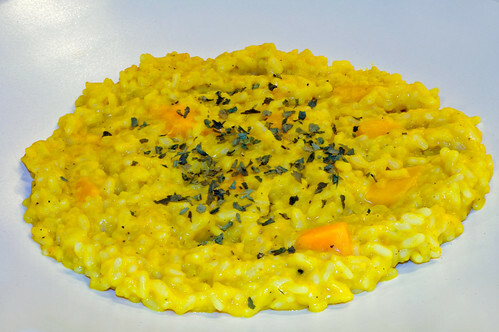 The butternut squash base took some careful preparation and I finally cooked the risotto so that it was al dente — not mushy like I have done before. Satisfaction. Now, as of late I have become rather eclectic with the desserts that I have been preparing at home. Devils food cake baked with ancho and chipotle chillies. Chocolate gelato made with sweet curry. Vanilla ice cream made with strawberries macerated in balsamic vinegar and brown sugar. This evening was no exception. I had prepared a custard with olive oil and frozen it. 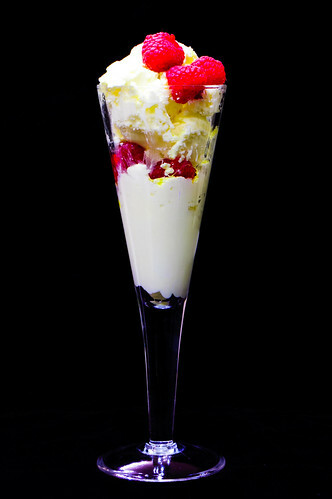 Olive oil ice cream with raspberries. Who would have thought? Yes, there are some who are cringing, wincing, spitting, and rolling on the floor. 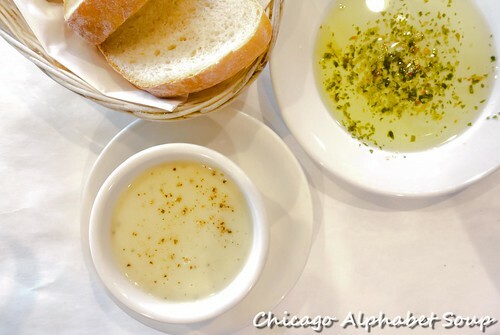 But the olive oil adds a fruity hint to the ice cream, unlike what you experience when you are dipping Italian bread in olive oil mixed with parmesan cheese and black pepper. 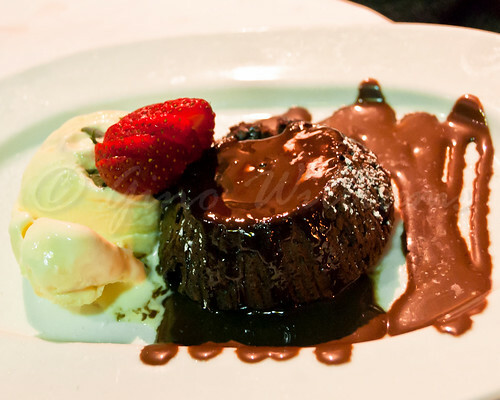 I get excited thinking about how refreshing and tasty the dessert was. 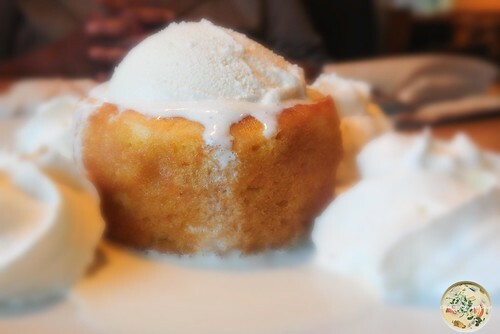 And just to be even more eccentric, I drizzled a sweet olive oil syrup over the ice cream. I do not know what to do with myself. 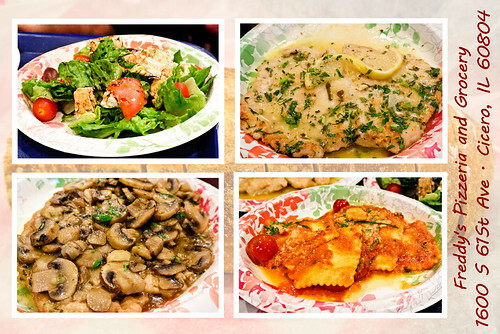 Well, I abided by the Foodie Bylaws and captured the main courses for your visual delight. At Il Sogno I used the camera on my cell phone and was rather surprised to see how well it captured the lobster da fravolo. With me having professional cameras, the cell phone is giving them competition. At home, I used one of my Nikon cameras. The risotto almost never made it because the smells were so powerful that my growling belly had kept telling me to hurry and get to gnashing on the dish. I complied. 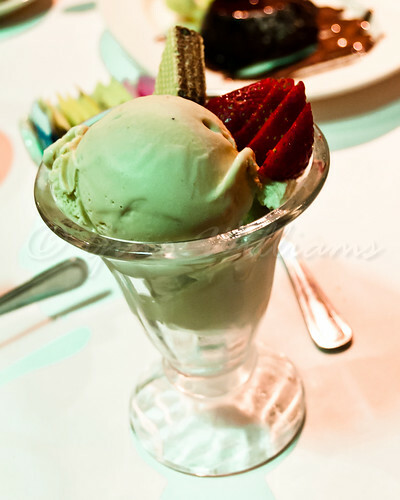 For the ice cream, I shall enjoy this special dessert for the upcoming week while I ponder the next exotic ice cream concoction I plan to try. Regardless of what it will be, rest assure that I will have a camera ready to capture the impressions. I simply cannot shirk my foodie responsibilities by not having a camera ready. For shame.